I just finished my latest layout, using Susan's (Raspberry Road Designs) kit "Gnome in the Garden." 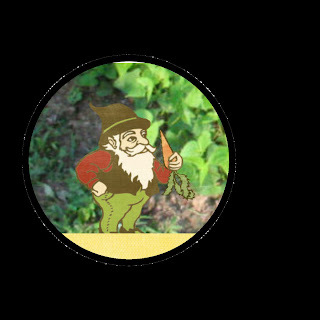 Here's a little preview, a close-up of the Gnome in MY garden. You can see the full layout by clicking on the title to this post. It will take you to Susan's CT blog. I hope you enjoy looking. Here's my little guy. Time for this old granny to hit the sheets. Take care and come back soon! You never know what you might find here.